After reading the 0Z forecast Thursday evening, I texted my friend Jeff that I'd make the decision when I got to the airport in the morning. Though strong winds out of the north seem to create less mechanical turbulence at Front Royal than south winds, 20 knot gusts across the runway could easily create too sporty a ride for first time passengers. I'd hate for them to make the long drive and not get to fly. Or worse, scare them enough that they'd never fly with me again. I arrived to a blue, cloudless sky and a slack windsock; the wind wasn't forecast to whip up until 10 am. To keep expectations low, I relayed that we'd be able to get a morning flight in, but it might get too rough in the afternoon. Jeff replied, stating they'd just go hiking in that event. Great attitude. Kayla went first, riding in the back of the ASK-21. We towed out to Signal Knob and, suspecting that it would be a sled ride that early, held on until 4,000 feet AGL before she pulled the release. I did my best tour guide impression, pointing out the sights and let her fly for a few minutes. There were narrow bits lift over the east ridge (later on, I was told that it was actually ridge lift). She was a trooper, having no problem with steep thermalling turns or the bumps on tow. 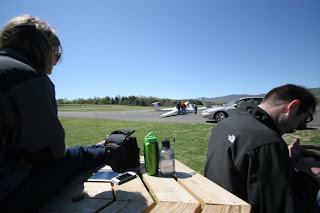 We found a few thermals near the Shenandoah river, south of the airport, and landed uneventfully on runway 10. Thanks to the graciousness of a few club members, the Grob 103 was available a few minutes later and I took Jeff up. Thinking I could get away with a lower tow because of the lift I'd found on the previous flight, we towed out to Signal Knob again. The wind had increased and shifted slightly, and all I could find was 8-10 knots of sink off of tow. I tried to speed over to the south to find a thermal, but we were too low and had to commit to land. The flight was only 12 minutes. We tried again an hour later in the G103. The towpilot reported that it was really rough aloft, but Jeff was unfazed. We climbed up to 5,000 feet in good thermals before I turned the controls over to him. I had to intervene a few times as he seemed to want to roll to a knife edge and struggled a bit with pitch control, but he did a good job for a first timer. I have a new respect for flight instructors, though. What a great day. It is an awesome feeling to be able to share soaring with friends.